Review: This is an incredible true story about the French journalist, Jean-Dominique Bauby, who in 1995 suffered a devastating stroke that left his mind active, but his body virtually totally paralysed. The only thing that wasn’t paralysed was his left eye. The French title for this film would be Le Scaphandre et le Papillon. This is such a bleak and upsetting subject matter. I can’t get over the cinematography of it all. I think it is such an amazing film. I was completely mesmerised. 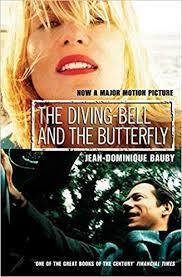 Both Mathieu Amalric and Max von Sydow give outstanding performances. The director Julian Schnabel learnt French to make this film. The script was originally going to be in English with Johnny Depp to play Jean-Dominique Bauby. He ended up dropping out because it conflicted with filming of the “Pirates of the Caribbean: At World’s End.”, 2007. It was the director who convinced the studio (Pathé, a French studio founded in Paris) to change the language to French in order for it to stay true to Bauby’s life and story. How different this could have been with Johnny Depp in and what a lucky escape. What a great masterpiece of film-making. The melancholy piano score makes the film even more sombre. A very moving film. The scene that really bought it home to me and which moved me the most was the scene and flashback that he has about Lourdes. This was because I can relate to that as I have been on pilgrimage there and volunteered in the hospital for a number of years. The late film critic Roger Ebert wrote about this film in his review which got me thinking “At the end we are left with the reflection that human consciousness is the great miracle of evolution, and all the rest (sight, sound, taste, hearing, smell, touch) are simply a toolbox that consciousness has supplied for itself. Maybe it would even be better to be Trumbo’s Johnny than never to have been conscious at all”. At the Golden Globe Awards in 2008 this won two awards for Best Director – Motion Picture and also Best Foreign Language Film. At the Bafta Awards in 2008 this won for Best Screenplay – Adapted. At the Cannes Film Festival in 2007, Julian Schnabel won three awards, Best Director, Vulcain Prize for the Technical Artist and also the Palme d’Or Award.